Tank Car -Chemcial Tank 40ft. There appear to be at least two variations to AHM's Rio Grande Pulpwood Car offerings over the years. To date, I've found examples featuring a black car with white lettering; plus examples dressed in a Rio Grande orange color with black lettering. Both are pictured above. AHM's collection of freight cars was certainly an interesting bunch. 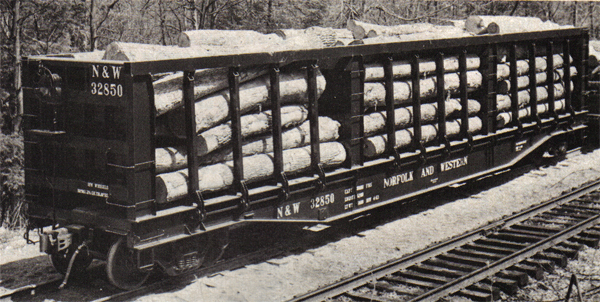 This Pulpwood Rack Car is among the more curious and obscure offerings. There is a prototype for the car and it is found pictured above. The 1966 edition of the Car & Locomotive Cyclopedia holds the answer on its page 276. The car is reportedly a Norfolk & Western Princeton, West Viriginia shops creation. The idea was to have a car that could handle more logs than a typical gondola. It appears the side gates are hinged and drop down to ease unloading. For those Rivet-Counters eager to add it to their pike, beware, it appears N&W build only a half dozen examples in the early '60s. No information is available to confirm that any of the six N&W cars were owned by any other roads, nor have I confirmed that they survived to the Norfolk Southern days. Though it is a rare prototype example, not only did AHM catalog the Pulpwood Rack Car, Atlas had this car among its N-scale offerings in the 1970s. The AHM examples I have examined feature the Roco diamond logo and Austria origin marks on the underframe of the car.